We choose to call our vodka Pristine because the word is what best describes it. Pristine is innovative yet traditional. Classic yet unexpected. In celebration of this, we’d like to introduce you to a great up-and-coming restaurant in Latham, New York. We’ll be hosting their grand opening celebration! Several years in the making, Kiernan’s boasts well-respected, industry veterans at the helm of an innovative menu. Owner Josh Kiernan has worked in two of the area’s best-loved restaurants (Black and Blue Steak and Crab and Prime at Saratoga National), and has spent no small amount of time and effort creating his unique concept. The menu boasts favorites and new creations alike. There’s something for everyone here. The Bar is being managed by another industry veteran, Barry Moscatello. With an impressive array of wines and spirits, and featuring the best vodka available on the market today, cocktails are about to become exciting again. At Pristine Vodka, we pride ourselves on knowing something good when we see it. That’s why we are proud to host the Grand Opening at Kiernan’s Craft Tavern. The event is this Friday, August 10th 2018. The party starts with hors-d’oeuvres, cocktails, and live music at 5:00 PM, with a ribbon cutting scheduled for 6:00 PM. The cocktails will feature Pristine Vodka, of course, so you know they’ll be amazing! 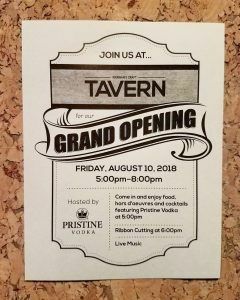 What: Kiernan’s Craft Tavern Grand Opening, hosted by Pristine Vodka. When: Friday August 10th 2018, 5:oo PM to 8:00 PM. Where: 579 Troy-Schenectady Road Latham, NY 12110. In Latham Farms. Pristine Vodka is Proud to be the very definition of pure, all-natural, and premium vodka. We’ll keep sharing what makes our world Pristine with you here on our blog!